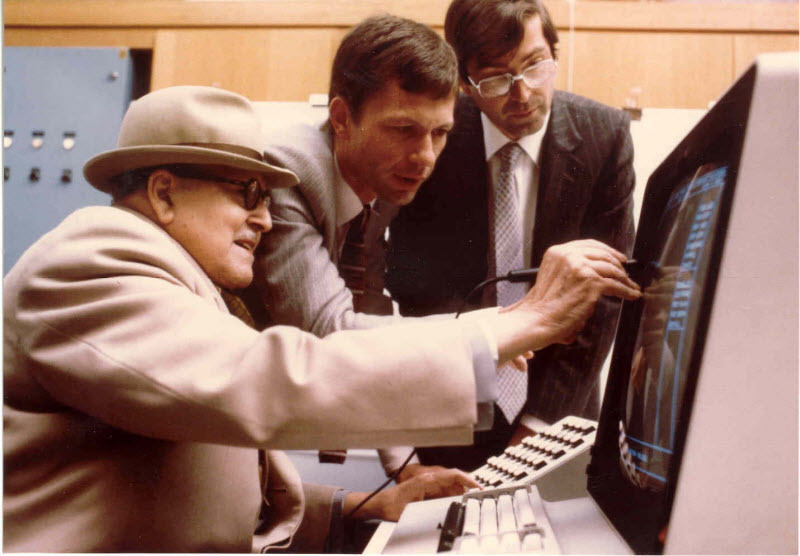 At the end of 1980, the CATIA rumor reached the very top of the company and Marcel Dassault, the 88 years old mythic founder of the company, ask for a demonstration of the software capabilities. He observed the design of a surface on the terminal and after a few minutes, he said to me, “Let me try it myself”. A picture immortalizes this moment. We see the great old engineer Marcel Dassault, Dominique Calmels, my technical manager, and myself on the right. Marcel Dassault immediately understood the value of our software. CATIA became so visible and promising that the management of the company started to debate on how to leverage such an innovation. Do we keep the product internally, taking advantage of its benefits against the competition, or do we decide to make it a new business of the Dassault Group and sell it outside the company? The first option was a dead end. As a matter of fact, at that time I had only 15 CATIA developers in my team. How could we afford to fund all the hundreds of developers we would need in the future to address the necessary features only for a single company? Obviously, we would have to replace CATIA by another product that we could buy when the CAD/CAM software market was mature enough. Therefore, I pleaded for the second option. I said, “Let us create a new company to develop and sell CATIA worldwide, in all the industries“. In doing so, we would accept the risk that the competitors of Dassault Aviation could also take advantage of CATIA, but this would also make it more easy for us to collaborate with our own partners and suppliers. This debate between the two options may look somewhat irrational and unnecessary today, the second option being the obvious one to choose. But it was not the case at that time. And I know several opportunities, including two potential CATIA competitors, that were missed by companies which selected the first option.